A relative of a patient from the UK who travelled to the Middle East and Pakistan and contracted a potentially fatal Sars-like virus has also been infected. Health experts revealed the new victim, also from the UK, is being treated at Birmingham's Queen Elizabeth Hospital. 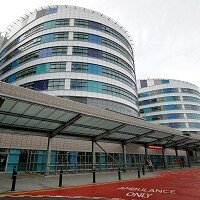 The latest announcement comes after the Health Protection Agency (HPA) revealed on Monday a man was being treated in intensive care in Manchester following infection with a new form of coronavirus. The latest victim to contract the disease, the family member, is not believed to have travelled recently and already has a condition which might mean more susceptibility to respiratory infections. Confirmed novel coronavirus infection in someone with no travel history to the Middle East suggested person-to-person transmission took place in the UK, said Professor John Watson, head of respiratory diseases at the HPA. Such scares underline the need for travellers to take out medical travel insurance before heading off abroad. With the new case, there are 11 confirmed cases around the world, three diagnosed in the UK, according to the HPA. UK health officials identified another case of coronavirus last year when a 49-year-old man from Qatari had to be treated at London's St Thomas' Hospital. However, health experts said the risk to the general population was still very low.